In this tutorial you are going to learn how to use a mortgage calculator for interest online so you can work out things such as monthly repayments and total interest amount. 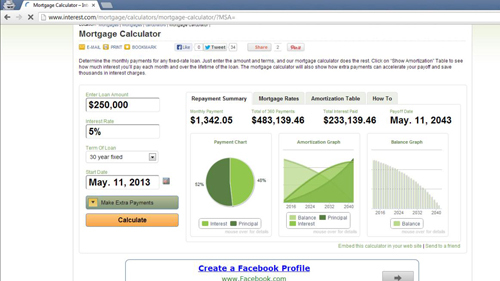 First you are going to need to visit a site that will allow you to calculate mortgage repayments easily, so visit “www.interest.com/mortgage/calculators/mortgage-calculator”. On this site you will see a graphical interface that allows you to see information about your mortgage in an easy to digest format. On the left you will be able to enter information about your mortgage. Enter a loan about, the interest rate you have been given and the term of the loan. This is all the basic information needed to get started, when you are ready click “Calculate”. 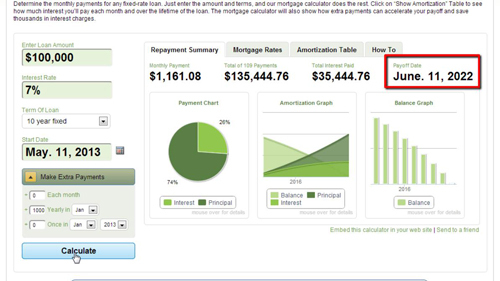 On the right the information will update and you can see the monthly repayment rate as well as a lot of other data about the mortgage. Finally, let’s have a look at entering some other data, such as paying off a fixed amount extra every year. Click the “Make Extra Payments” button and enter how much extra you are able to pay. In this example we are going to choose to pay off one thousand extra dollars in January each year. 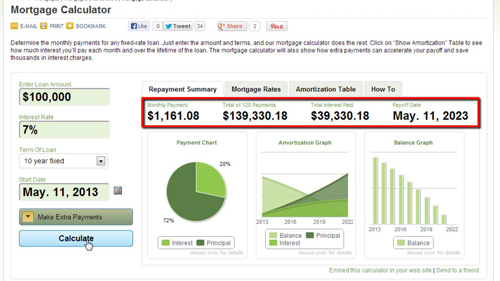 Click “Calculate” and you can see that the mortgage end dates shortens. That is how to use a mortgage calculator for interest rates online.